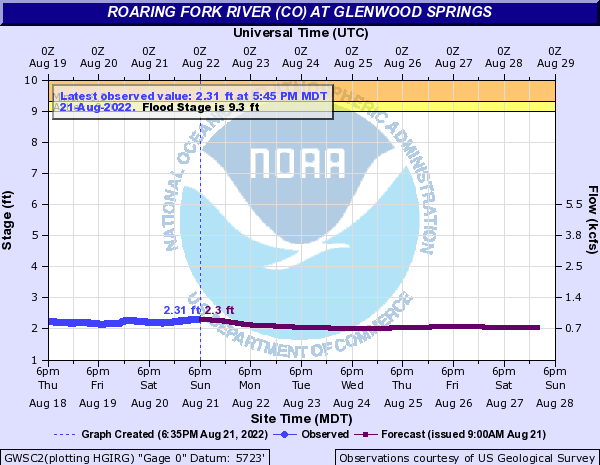 Primary Gauge ROARING FORK RIVER AT GLENWOOD SPRINGS, CO.
Dirt/rock ramp to a small rocky eddy. Good tires and 4WD recommended. Limited parking on the shoulder of the road above. Popular access point below the confluence of the Colorado and Roaring Fork rivers. Concrete ramp located in park with BBQ's, shade, water, ball fields, pavillion.